Gothic Doom metal band Tears Of Rain(ToR) originate from České Budějovice, which is a town in the south Bohemia known by production of a very good beer under name Budweiser. 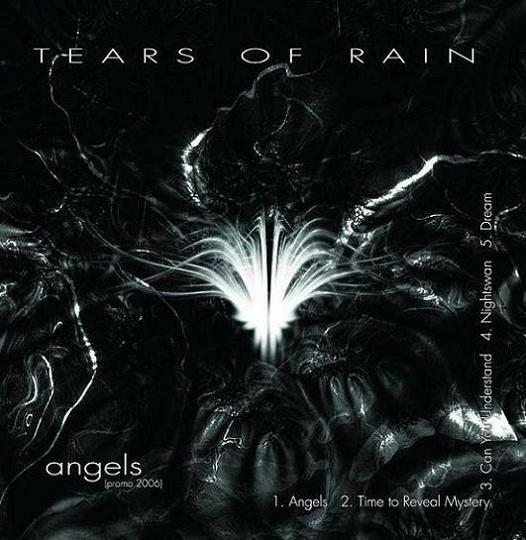 This band was found in year 2006 and CD Angels is its first demo. And it is very successful record, at least according to my opinion. When you listen to this album, you almost immediatedly get idea of Nightwish. An influence of the famous metal band from Finland cannot be overlooked. However, it does not mean that ToR only copy Nightwish. Contrariwise. They play their own music based mainly on melodic keyboards, guitars and enchanting female vocals of a women singer Šárka. I like her voice very much. I cannot help myself but She remind me of Tarja – the former songstress of afore mentioned Finnish band Nightwish. When listening to the music thoroughly, you can hear double vocals on Angels as well. Another speciality of this band is a female drummer. As to the beat, it could be more varied,I suppose. There is only one kick used for example and I would add some changeovers now and then as well. But on the other hand one must admit that ToR do not play Speed Metal or technical Death Metal. All songs are mostly in slow and midlle tempo as it is for Doom Metal typical. Basically, I do not find any embarrassments on the demo. The sound is very clear and all the instruments are well-balanced. Very good work, really. So, if you like such kind of music, then do not hesitate and buy this CD. I am sure that you will not regret it. What else to say in fine of this rewiew? Members of ToR are going to record the next album soon and I wish them to be at least as successfull as in case of Angels.